As many of you already know, I participating in the Cool Down with Agatha Christie readalong that's running all summer long. I love that I've had the chance to read and discuss some terrific Agatha Christie mysteries, and I can't believe how much I'm enjoying them. I hope you'll find the time to join us in the final month of our readalong. In the meantime, I wanted to share with you a new contest that is going on over at the Agatha Christie official website where you can win a set of Agatha Christie books. To celebrate HarperCollins reissuing of Christie’s complete title list in the US, we’re offering TEN Christie fans the chance to win the first TEN novels to be released. These new trade paperback editions are completely repackaged with beautiful new covers and series information noted on the front, spine, and back of the books so readers always know what to read next. 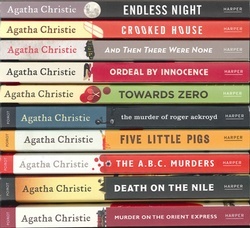 All of the books are the authentic editions from the UK texts, with Christie’s novels and stories as she originally wrote them. The first set of books is available in bookstores now and many more will be released throughout 2011. To enter this incredible giveaway just register to receive the US Christie newsletter, or if you're already registered with the site, select to receive the US newsletter in your profile settings, it’s that simple! Not only do you get the chance to win TEN beautiful books, you’ll also get the latest Christie news and insights delivered straight to your inbox every month - it’s what’s known as a WIN-WIN! So why don't you Cool Down with Agatha Christie this summer and enter this fantastic giveaway?